from an interview with Neil Douglas-Klotz by Dr. Matthew Fox on August 14, 2003 broadcast on the “Spirit in Action” radio show on KEST 1450 AM San Francisco. 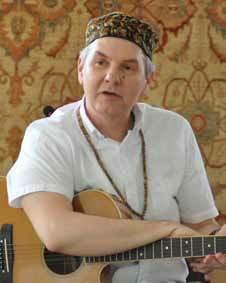 A talk given on March 8, 2014 at the annual conference of the Academy of Self Knowledge in Centurion, South Africa. The theme of the conference was “Spiritual Illumination in the World’s Spiritual Traditions.” The talk centers around the story of Jonah’s ‘endarkenment’ in the whale and how this might be seen as a metaphor for daily life in the 21st century. (31 minutes). “99 Beautiful Names of Allah.” 48 minutes, mp3. 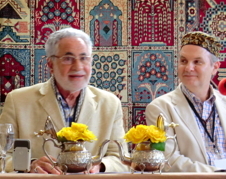 On July 5, 2010, the birthday of the Sufi Hazrat Inayat Khan, I was asked to give an introductory talk and chair a panel on the topic above. The gathering was held at Murad Hassil, the universal temple of the Sufi Movement International at Katwijk, Netherlands. This was to commemorate the 100th anniversary of his coming to the West. Representatives of the Sufi Ruhaniat, Sufi Order International, Sufi Movement, Sufi Way and Sufi Contact all participated. This podcast is my introductory talk, about 27 minutes long. 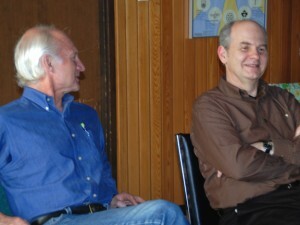 An informal conversation with Bruce Chilton, Neil Douglas-Klotz, Jim Garrison and Mark Hathaway at Wisdom University’s 5-day colloquium near Toronto, Canada, on May 6, 2010. This conversation was part of an informal evening with students at Wisdom University’s 5-day class series near Toronto (see www.wisdomuniversity.org). The first 30 minutes includes contributions (in order) from Bruce Chilton (author of Rabbi Jesus and many other books), Neil Douglas-Klotz, Wisdom University President Jim Garrison and Mark Hathway, co-author (with Leonardo Boff) of The Tao of Liberation. In 1990, Dr Neil Douglas-Klotz pioneered a poetic approach to interpreting and understanding the words attributed to Jesus in the Gospels from his native Aramaic language. 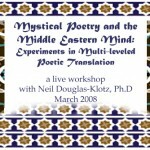 Drawing upon the centuries-old Jewish tradition of midrash (interpretive translation), Douglas-Klotz used a traditional Syriac-Aramaic version of the Gospels to show how a non-Western listener might have heard the words of a Semitic prophet in a multi-leveled way. 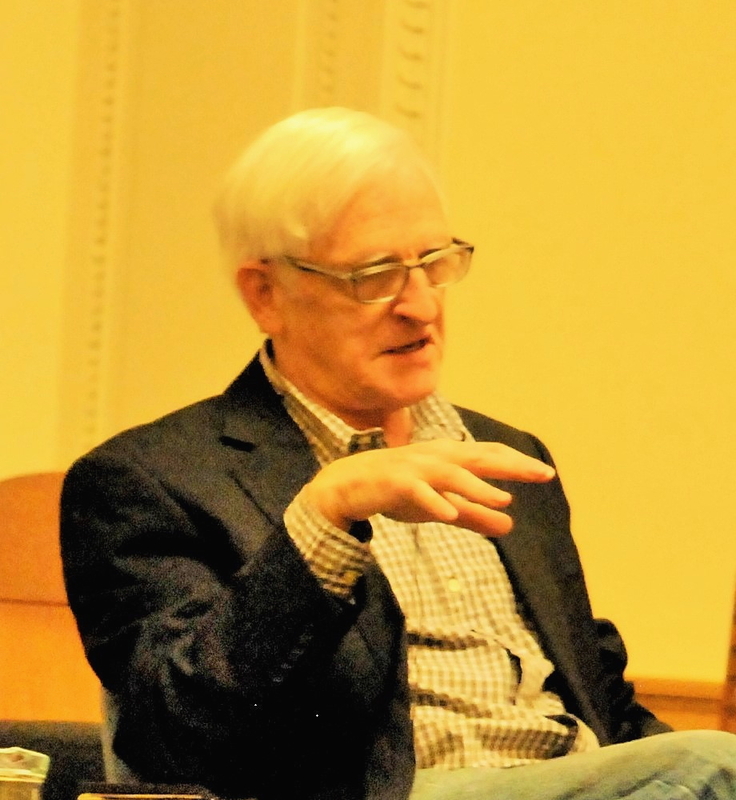 His first book, Prayers of the Cosmos, became an international bestseller and led to subsequent works continuing the exploration, which have raised many questions for Biblical and Quranic scholars about their own methodologies. During this evening mini-course, he discuss the use of multi-leveled poetic verse to translate and interpret ancient Semitic languages in a way that fits the worldview and ways of knowing inherent in these cultures. He relates his work to the movement of ethno-poetics, beginning in the 1970s and talks about his personal background and preparation for the work. He reads from and discusses a number of his translations from the Aramaic of the words attributed to Jesus, from translations of mythic poetry from the Hebrew bible and from verses of the Quran, including selections from the books Desert Wisdom, Prayers of the Cosmos, The Hidden Gospel, Genesis Meditations and Blessings of the Cosmos. This short course was offered on March 3, 2008 as part of the 5th Edinburgh International Festival of Middle Eastern Spirituality and Peace.